Shankly's initial interest in a position at Huddersfield was fuelled by his connection with their manager Andy Beattie. Shankly and Beattie had played together at Preston and had remained friends so when, in 1955, Beattie had approached Shankly, with a view to asking him to help out at Leeds Road, Shankly accepted. His initial position at the club was as coach to a reserve team that included several promising youngsters. The improvement in the fortunes of the reserves was in direct comparison to that of the first team who were promptly relegated from the first division. Thus, in season 56-67 several of Shankly's reserve side found themselves in the first team as Huddersfield adapted to life in the second division. 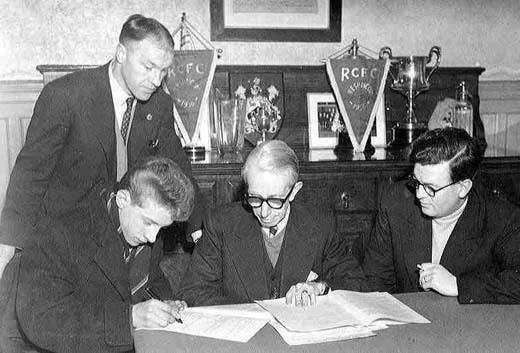 On 5th November 1956, Shankly became first team manager after Beattie resigned his post and on Christmas Eve 1956, he gave a full first team debut to one of the rising stars of the club, 16 year old Denis Law. During his time at Huddersfield, Bill took part in a kickabout every Sunday with the locals on a field in Crosland Road near where he was living. He would play whatever the weather and would go in as hard on a ten year old boy as he would on a grown man, never holding back or altering his style for anyone! Shankly became increasingly frustrated at the lack of ambition shown by his board of directors. They were constantly urging him to sell his best players (Ray Wilson was sold, and Matt Busby was keen on Law), whilst at the same time failing to sanction the purchase of any possible replacements. In November 1959, T.V. Williams, Chairman of Liverpool, offered him the Liverpool job, and after 13 years in management, much of it at basement level, Bill Shankly had found a club that shared his own ambitions about the game and were prepared to give him full backing to achieve them. "Pressure is working down the pit. Pressure is having no work at all. Pressure is trying to escape relegation on 50 shillings a week. Pressure is not the European Cup or the Championship or the Cup Final. That's the reward."